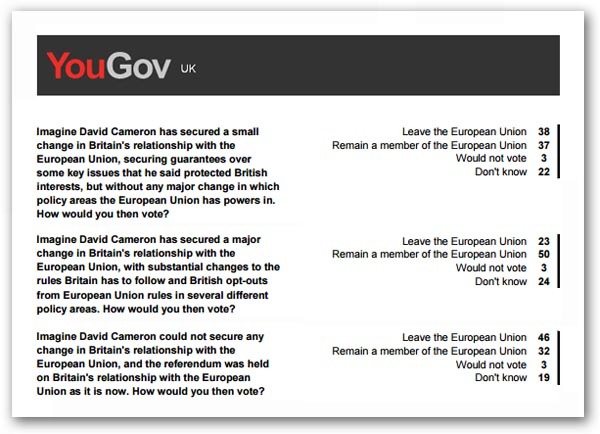 Adding to my piece yesterday on polling results, we have an additional survey from YouGov which looks at responses to various EU “renegotiation” scenarios. In the first of three, respondents are asked to imagine that David Cameron has secured a small change in Britain’s relationship with the EU, obtaining guarantees over some key issues that he said protected British interests, but without any major change in policy areas in which the European Union has powers. The second scenario has respondents imagining that a major change in Britain’s relationship with the EU has been secured, with substantial changes to the rules Britain has to follow and British opt-outs from EU rules in several different policy areas. Third comes a failure scenario, where David Cameron does not secure any change in Britain’s relationship. The referendum is held on Britain’s relationship with the EU as it stands now. In each case, respondents are asked how they would vote. In the “small change” scenario, the “leavers” get a small victory: 38-37 percent. When Mr Cameron succeeds with big changes, he gets a comfortable win, scoring 50 percent against 23 – more than two to one in favour of remaining. In “failure mode”, a substantial victory goes to the “leavers”: 46 as against 32 percent. Caution is advised in all cases, and the “don’t knows” and non-voters are high, coming in respectively at 25, 27 and 22 percent. Across the board, the margins are sufficient to tilt the verdicts into the opposite camps. A year ago, YouGov had already conducted this exercise, but without the “small change” scenario, giving a 58-25 percent victory to a Mr Cameron who brings back “significant reforms”, with the “leavers” claiming a 43-35 percent victory in the event of failure. Interestingly, there are slight movements in the figures year-on-year, with an indication that the “failure mode” penalty is strengthening. Either Mr Cameron delivers or he is toast. The electorate don’t seem to be in a mood to accept half measures. The greater utility of these polls, though, is that they point to the decisive factor in the referendum being the outcome of Mr Cameron’s “negotiations”. The referendum is not going to be decided on the issues. Despite this, we have the likes of Goodwin et al seeking to determine the effects of different arguments on the referendum. They show that none of the common arguments raised “had statistically significant effects on the ‘remain’ or ‘leave’ vote at the aggregate level”. But even to attempt to determine an effect is a mistake. All their work does is confirm that which we already know: the various issues (as defined) are irresolvable. Whatever argument there is on one side can be matched by arguments on the other side. There are no clear black-and-white answers. In these circumstances, one then has to look for other decision drivers. For these one can rely on basic human psychology. When confronted with the need to make crucial decisions, where it is impossible to make a rational decisions due to conflict of evidence (or even information overload), people use different stratagems. Mostly, the will seek advice from people they know and trust, or from those in authority – people with prestige. And in this referendum, the dominant, high-prestige player will be the Prime Minister. He is the only who will be seeking to convince people that there has been a satisfactory outcome to the negotiations. He will be putting his reputation on the line, exploiting his prestige to maximum effect. As one might expect, Goodwin et al show no signs of understanding this dynamic. There is no indication that they are even aware of its importance. Nor indeed do the high-noise campaigners, who are apparently committed to fighting the campaign on specific issues. Most probably, they are failing properly to distinguish between elections and this supremely complex referendum. But, while elections are sometimes defined by specific issues, this is not the case with this referendum. The focus thus far on issues, such as the cost of UK contributions, has been a waste of time and money, and will have no effect on the outcome. However, whether or not the noisemakers start focusing on the pivotal issues currently seems less important than whether Mr Cameron can deliver a credible renegotiation narrative. If it is too weak to convince, then the tactical errors the Prime Minister has already have made could seal his fate. The essential difference between the two sides, though, is that in a real life situation, when the voters are fully focused on the contest, the “leave” campaign has additional hurdles to surmount. Mr Cameron may fail to convince but to be sure of winning, we must offer an alternative vision and credible assurances that delivery is feasible. Otherwise the “fear factor” kicks in and the electorate holds on to nurse. Thus, even if Mr Cameron fails to win, we can still lose. It is us to us to make sure that does not happen. The good news is that this might not be as difficult as we first thought. Previous Previous post: GP>RN – Reading The Polls!